I was invited to a grand opening of a Chinese Restaurant in Banawe St, Quezon City. I was contacted via Facebook by Abigail Ang from EVENTUS KINETIX-IMC CORP who is the event organizer. I was a bit shock as my blog is still new and feel kinda flattered to be invited. Somehow I couldn’t resist the thought of meeting fellow food bloggers and making new friends. I am happy that I decided to attend the opening ceremony of King Chef as I enjoyed the event and experience a lot. Surprisingly I never visited Banawe before during all my years in Manila. Is like a mini Chinatown and I see a lot of Chinese restaurant here. 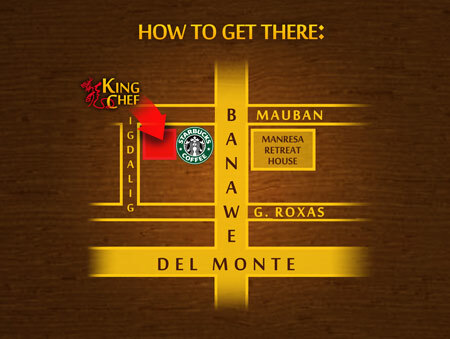 King Chef is located just next to Starbucks and amongst many other Chinese Restaurant in Banawe St. As I got down from the cab, I was still feeling a little bit uneasy as this is the first time I am being invited for a restaurant opening as a blogger. I’ve been to many grand opening and parties, but those are different as I’m being invited as a guest or a friend. As I walked to the entrance of King Chef restaurant, I saw quite a number of people and some lion dance and dragon dance troupe. This made me a little bit more nervous as the opening seems pretty grand. I observed a little while people are going to the registration counter. I decided to man up and just go register myself. I asked if Abigail was around and she happened to be nearby and I introduce myself. We had the customary handshake and introduction and she told me that she is glad that I made it. She asked me to proceed to register myself with the girl who is in charge of registration. She asked me which media company I belong to and I just said I am a blogger. She then asked me which blog and I said “Spicegasm”. I felt relief when she had my details with her and that saves me from the embarrassment of not being in the list. Since I am alone, I just observed and looked around the restaurant. Looking at the menu and trying to connect with some fellow bloggers. I have to say Abigail is really a good organizer as she asked me to join a group of three young reporters from Summit Media. Summit Media is actually the company that produces one of the best selling magazines in the Philippines. I am sure all of you heard of the magazine FHM. We introduced ourselves and I was very happy to be in the companionship of Anton, Andrew and Mitch. We talked about food and life in general before helping ourselves to some food prepared by the host. I will post some pictures of the event tomorrow or day after. I will also make a special post about the restaurant itself as this event will surely be remembered by me in years to come. After all this is the first restaurant that invited me as a food blogger. In the meantime, here is the map to King Chef and hopefully with this information provided, you get to visit a new restaurant and King Chef will be able to get some new customers. I will post the menu and also pictures of the dishes soon. Pictures look pretty good….